With New Release Version 5.1.12 (available to all corporate edition customers) we introduced improvements to the ‘Search Jobs’ screen. Rather than having the data in one long list, search results are now presented in pages with the ability for users to specify the number of records per page. You can also click back and forward to look through pages, or to jump to a specific page. 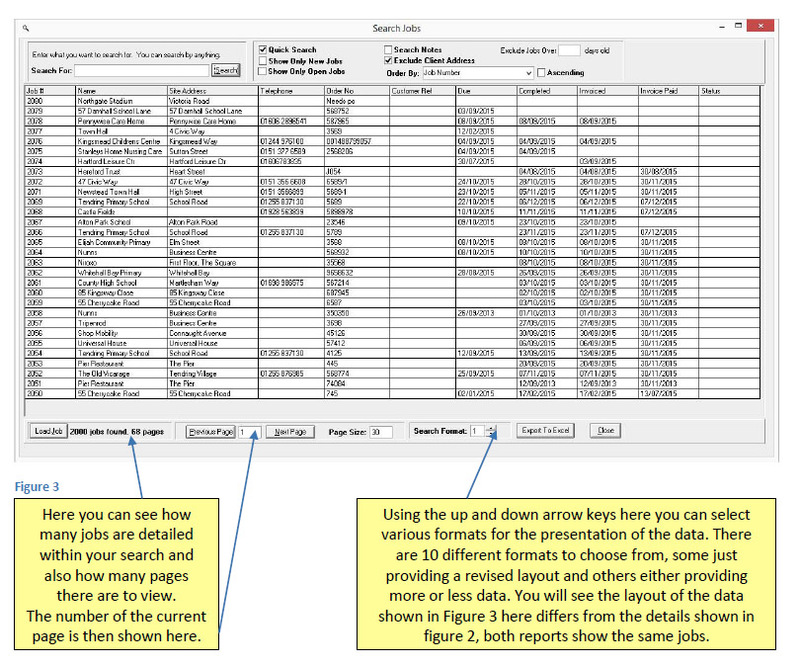 Like before, results can be exported to excel, you can still select to have the data presented in ascending order or descending, and you can still adjust the format that the results are presented in, but now the revised layout will refresh and appear on screen simply by clicking on an up or down button selecting your preferred style, without the need to re click search. Enter your search criteria in the ‘Search For:’ field on the top left of the page as usual. In the ‘order by’ field, select how you wish to order the results i.e. by address, job number or name. Either tick or untick the ascending field depending on how you want the result presented. At the bottom of the screen, in the ‘Page Size’ field, you can type in the number of records that you want to appear per page, this can be altered before or after you click search. To amend it afterwards simply type in the number of records that you want shown per page in the ‘page size’ field and click enter or click search. 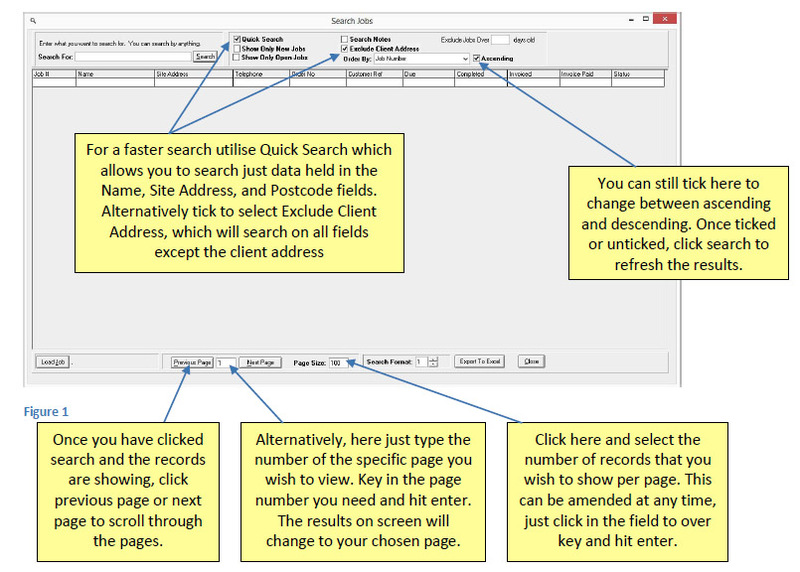 The Quick Search tick box and Exclude Client Address tick boxes allow you to limit your search to exclude or only include certain fields, this will help return your required results quicker. You can amend the number of records shown per page to suit your preferences, screen size etc. You can also still change the format of the results, with 10 different options available. The difference is that now as well as being able to type the number of your preferred format, you can choose to utilise an up or down arrow key to scroll through the various format options available. Once you have your chosen format you still have the option to export that data to Excel at the touch of a button. Once you have your preferred view on screen you can also amend the column size to suit your needs and preferences. These changes are designed to make it quicker for you to view and access the records that you need in order to run an efficient business. Like before, once you have the details on screen you can easily access a specific record by either a double click on the appropriate record or highlight the record and click load job. 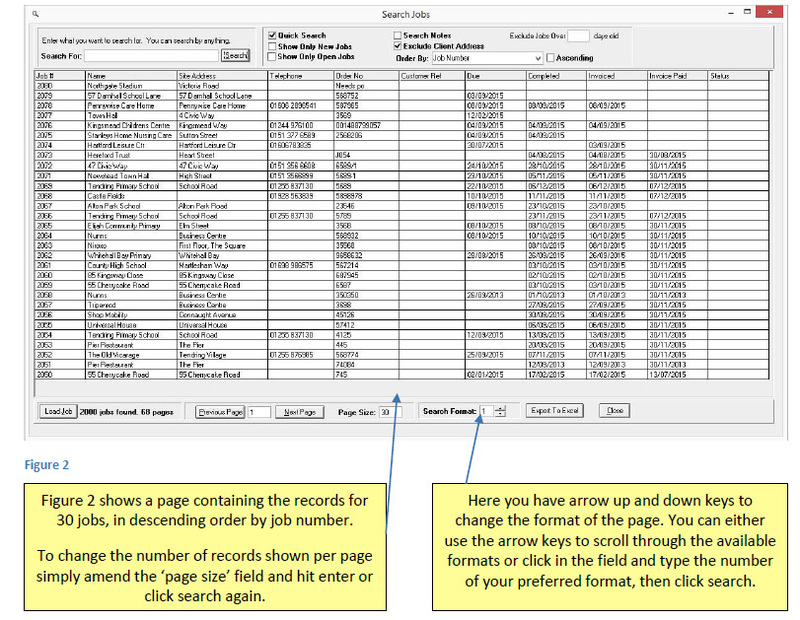 This enhanced Search Jobs screen is available to all those running the corporate edition.